Discussion about the reading and writing of children’s books. Fact: children who do well at school have something important in common – they read for pleasure. So even a government that needs to dream up austerity measures should think very carefully before cutting library services. Here is an open letter from the Children’s Laureate (and Gruffalo author) Julia Donaldson to the new Secretary of State for Culture. I have reproduced it here in full because of my total support for what she is saying. Congratulations on your new appointment. I am writing with a plea. In my role of Children’s Laureate I am about to embark on a six-week tour of UK libraries, acting out stories with visiting schoolchildren. The main aim is to celebrate libraries and all that they have to offer children – the books, the browsing, the author visits, the research facilities, the toddler rhyme sessions and summer reading programmes. But I’m also hoping that the tour will draw attention to the erosion of the library service which is happening in so many local authorities, and to the current government’s utter refusal to intervene or to provide any leadership. Recent figures from Public Libraries News show that nearly 250 UK libraries are currently either under threat of closure or else have been closed or left council control since April this year. A survey, conducted by the Chartered Institute of Library and Information Professionals, estimates that during this financial year 2,159 library staff posts out of a total of 20,924 will be cut. This is on top of huge cuts in previous years. These vary disproportionately from authority to authority, so that while in some areas children and families can still have access to a safe space where all are equal and welcome, in other places this is no longer so, with cuts in budget of up to 35 per cent and cuts in book stocks of up to 90 per cent. The 1964 Libraries Act states that every authority must provide a “comprehensive and efficient” library service and that the government’s duty is to investigate when there are serious complaints that this is not the case. Yet this government has not once intervened, even in the case of Gloucestershire where nearly half the libraries were scheduled for closure last year. Your predecessor Jeremy Hunt and the Libraries Minister Ed Vaizey refused to respond to letters, invitations and presentations by the campaign groups, except by parroting the assertion, “We are monitoring the situation”, so that the campaigners were forced to take the local council to court (successfully). When I met with Ed Vaizey in February and asked him why he had not intervened his reply was, “Because my advisers didn’t advise me to”. Could you, in your new post, please give him some guidance from above? Mr Vaizey also told me that he “did not accept” that there was any problem in the library service. This may be because he is happy with the idea (now a reality in some areas) of libraries being run entirely by volunteers. I am shocked that he could consider this anything more than a short-term measure. This summer, while visiting France, I had an engagement in a village library whose users were thrilled because at last they were getting a professional librarian. Yet we are going in the opposite direction. Of course volunteers have a role to play, and of course it is preferable to have a volunteer-run library than no library, but what I object to is the tendency to dress this trend up as “vibrant twenty-first-century thinking”, instead of being honest enough to admit that it is a reluctant response to cuts. I am particularly concerned about the effect the cuts and closures are having on children’s reading. Today many towns have no bookshops. If they also have no library, where are children to find books? Is it a surprise that we are always reading horrifying statistics about the number of homes without books? If children don’t discover what books they like, they are unlikely to become life-long readers, and we are therefore heading for a less literate society. Illiteracy leads to lower skills, greater social problems, higher crime rates, and a country less able to prosper in the global jobs market. So cutting libraries is a false economy. They are the best literacy resource that we have. Children’s use of those libraries which are still open has actually been rising over the last seven years, so please don’t deprive them of the storytelling sessions, the homework clubs, the expert librarians and, above all, of the free books. 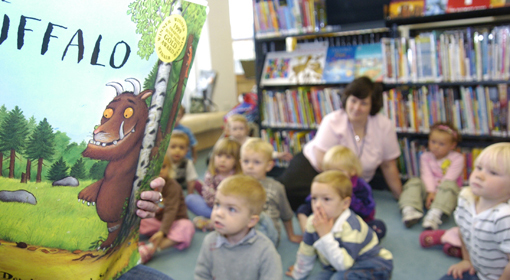 Will you consider ring-fencing council spending on children’s library services? Will you discuss with your colleagues the possibility of using some of the education budget for this purpose? Above all, will you (unlike your predecessor) respond to concerns and complaints, and show some leadership for our young readers? I do hope so. I would be more than happy to meet with you to discuss this further. when a door called my name and pulled me inside. 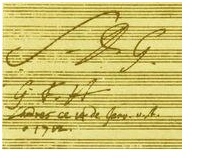 The composer Johann Sebastian Bach famously used to write the initials SDG (Soli Deo Gloria) at the beginning and end of many of his compositions. Where would we look for a modern equivalent of that brief but weighty eighteenth century inscription? The Oscar acceptance speech of a Best Supporting Actress (“I want to thank God and my manicurist”)? The goal celebrations of a Brazilian footballer? Episcopal mumbo-jumbo at the Palio di Siena horserace? Moussa Konate where are you? If anyone has seen Monsieur Konate, please comment below. FILO finishes on Thursday. Posted on December 21, 2010 January 15, 2016 Categories Children's BooksTags Burkina Faso, FILO, Ouagadougou1 Comment on Moussa Konate where are you? Pierre-Claver Ilboudo talked the other day about making books more accessible. Well, here are some people who are doing just that. 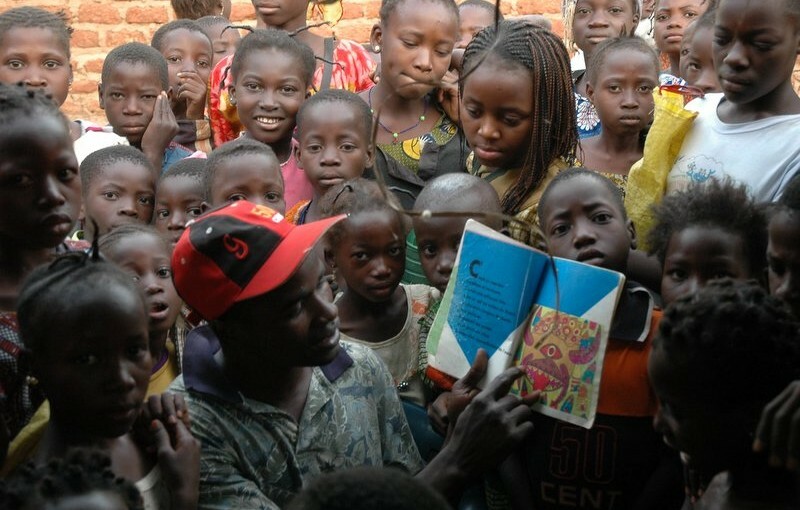 Friends of African Village Libraries are doing some great work to raise the profile of books and literacy here in Burkina Faso. They take buildings donated by the community and turn them into libraries, stocked so far as possible with books by African authors. It’s a great idea and their stand at FILO this week was by far the most inspiring stand on site. I shall be keeping a close eye on the FAVL blog, which combines West Africa gossip and opinion with a genuine passion for books and libraries. Amongst other things, they have produced a series of delicious-looking Reading West Africa books, which everyone at FILO wants but can’t have. According to their ‘About’ page, “FAVL operates under the belief that true development can only happen when people are empowered by access to information and the habits of reading and critical thinking.” Too right. Am negotiating the sale of ‘Albino Camel’ book rights with an African publisher here at FILO. Sticking point: he is proposing a cover price of 11,000 CFA – that’s almost 15 pounds sterling. Bear in mind that a typical day wage for unskilled labour here in Ouagadougou is 1,000 CFA and you’ll see what the problem is. Eleven day’s wages for one slim volume. This is precisely the problem with the publishing industry in Africa, and one of the main reasons that reading has such a minimal place in African culture. This week I’m blogging from Ouagadougou’s International book festival – the ‘Foire Internationale du Livre de Ouagadougou’ (FILO). I’ve been looking forward to it for a long time. It’s hardly Frankfurt but it still has a certain buzz. The most interesting speech at the opening ceremony yesterday was from Pierre-Claver Ilboudo, who exhorted all writers in Africa to persevere with their craft. Burkinabe writers are facing an uphill battle, Ilboudo said, for three reasons. Firstly, it is hard to write here. The oral culture of Burkina Faso has little time for the written word, and does not provide a ‘serene’ atmosphere for the work of writers. Secondly, it is hard to publish. The financial realities of publishing in subsaharan Africa are grim: it’s a very long way from the manuscript to the bookshop (that phrase works better in French, of course, because ‘manuscrit’ rhymes with ‘librarie’). Every book represents a business risk, and nowhere more so than in Burkina Faso. Thirdly, it is hard to find readers interested in buying (or even borrowing) books. Ilboudo said that books in Burkina Faso need to be available (bigger print runs) and accessible (lower prices). He encouraged his listeners to give books as Christmas presents this year! He called on the state to provide funding for literature in the same way as it does for cinema and music. He called on writers to be more unified – there are four separate Writers’ Guilds in Burkina Faso. How can the writers of Burkina communicate their ideas to the world if they can’t even communicate to each other? After Pierre-Claver Ilboudo’s speech, the Minister of Culture declared the book festival well and truly open, and we all swarmed into the exhibition halls to see what we could see. More about the exhibits tomorrow.